In their first home match for the Champions League, FC Porto put in a dominant display against the group's other top dogs. Vítor Pereira went with Danilo, Fernando and Varela ahead of Miguel Lopes, Defour and Atsu, respectively. Paris Saint-Germain manager Carlo Ancelotti kept most of his team intact, with Ménez alongisde Ibrahimovic and Nenê behind the two forwards. It's not every day that we see a Portuguese team looking the favourite part, especially in the Champions League and against a team filled with stars, such as Paris Saint-Germain. Apparently unimpressed with the financial numbers that flew around the media over the past few days, Pereira's men set out to give the French team a run for their money and showed how much they have improved from last year (and last match against Rio Ave). 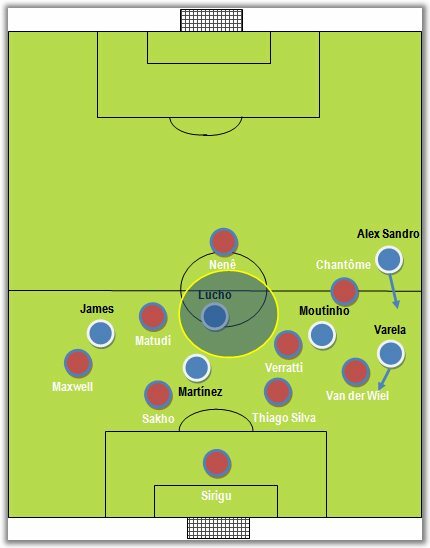 The Dragons presented a quite high defensive line, most likely to prevent Ibrahimovic from playing too close to FC Porto's box, relying that neither Ménez nor Nenê would present any real danger coming from behind. As for Paris Saint-Germain, the order was to sit back and wait for FC Porto's initial pressure to wear down and take it from there. Facing their opponents' 4x3x1x2 (with Nenê behind Ibrahimovic and Ménez), the Portuguese champions emphasised all the more their usual attacking traits, exploiting and overloading the wings - namely (and almost exclusively) the left one. With James somewhere between the centre and the right and Varela on the left, FC Porto kept ramming down their left side with Alex Sandro, Moutinho and Varela. With the latter's natural width, Ancelotti's diamond-shaped midfield was too open to contain the threat. The schematics were very simple and lasted throughout the whole match. Alex Sandro would start the move high up the field, immediately occupying Chantôme (who, truth be told, rarely played tucked in, as he should have). Varela was picked up by Van der Wiel and Verratti would then come up to meet Moutinho, afraid to let him in through the centre - effectively opening up the middle to James or Lucho. With the same play and a few triangle-shaped passes, the Portuguese team created a barrage of scoring chances. Typical FC Porto movement down the left. Verratti was dragged too easily out of position. 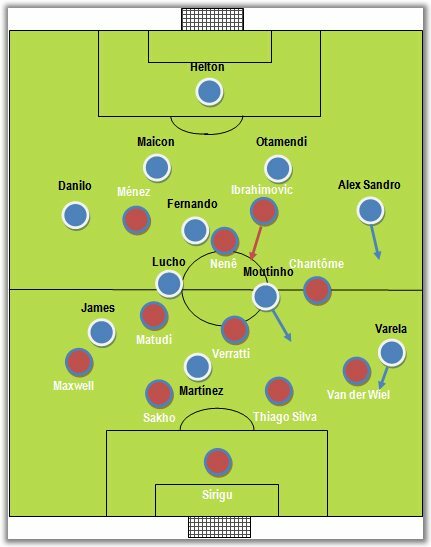 With Ibrahimovic and Ménez offering very little defensively and Nenê switching on and off, FC Porto were often allowed to play at will down the left or the middle, since help would often come (very) late from Matuidi or the centre-backs. Therefore, it would not pose too big a risk that the 20-odd attempts on Sirigu's goal frequently constituted clear-cut chances. As for Paris Saint-Germain's attacking plan, there often seemed to be none, apart from waiting for the Swedish maverick to get his bag of tricks out (which almost panned out after a lovely flick-on on the 11th minute). The only stage at which the Parisians seemed to offer a real threat was the first 10 minutes of the second half, where the FC Porto midfielders lost their coordinates a bit and were too greedily pushing for the goal, almost getting punished for it. However, Lucho's coolness and Moutinho's stamina brought back the order and the Dragons quickly picked off where they had left off. Despite all their profligacy, FC Porto deserved the win - so much so that they can might come to regret not scoring some more. James Rodríguez's goal may have come a bit late for FC Porto fans, but it meant that the three points would remain at the Dragão. After the latest wins in succession, Paris Saint-Germain were disappointing and can only blame themselves for such a poor match. In fact, they will probably find themselves lucky to only concede a goal. Also, it's hard to understand why Ancelotti, usually a gifted reader of the game, didn't offer any solution to oppose his adversary's natural advantage down the wings.